Certificate #2 is much better. This one, however, gives Patrick a death date of the 6th, not the 5th like above. 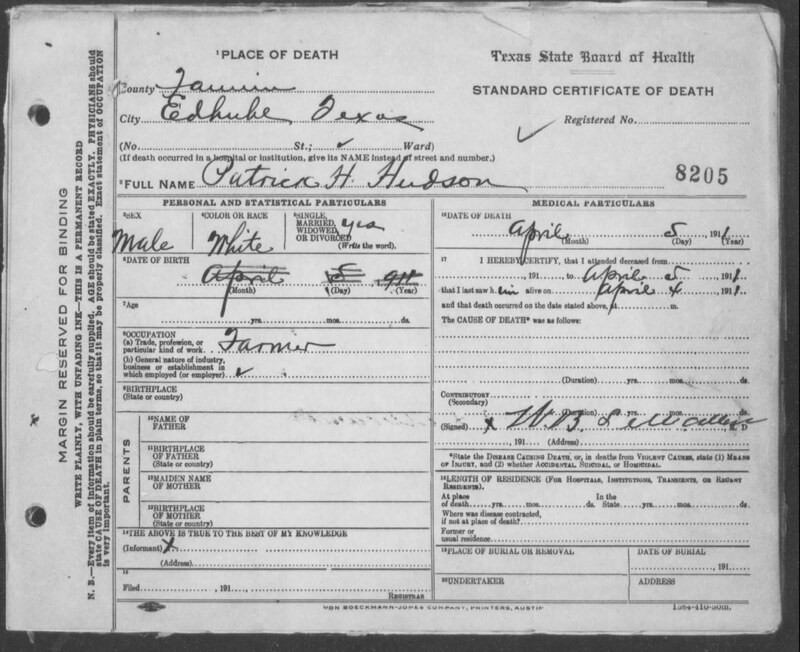 It also provides some personal information on him like his birthday (Feb. 19, 1840), place of birth (Pulaski Co., Kentucky), his father's name (Vincent Jackson Hudson) and his mother's maiden name (Vaughn). I was also able to learn where he was buried: Hampton Cemetery in Bonham. Certificate #3 fills in the rest of the picture. 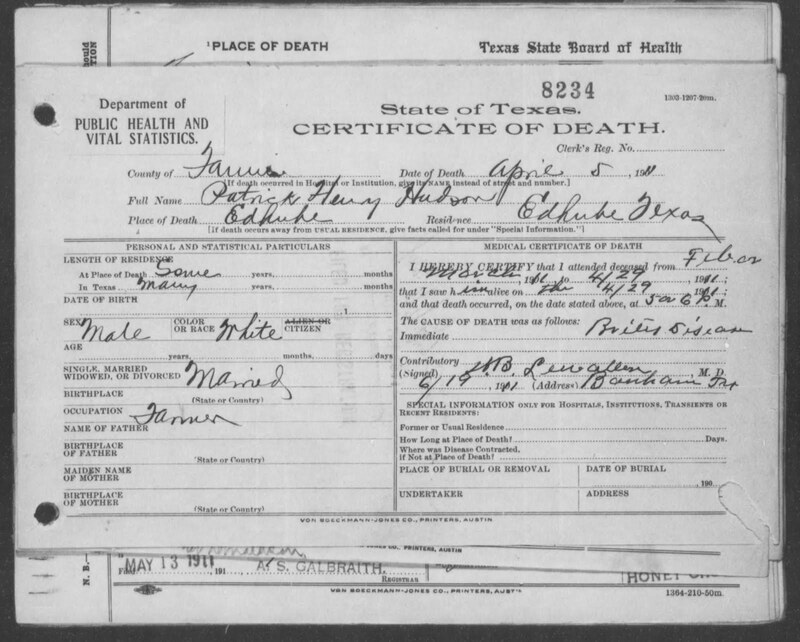 Medical information (like cause of death) is included in this one. His death also changes again to the 5th. 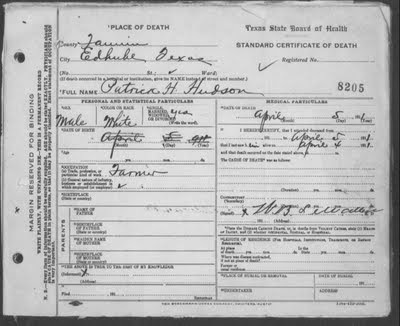 This certificate also asks something that the others didn't, how long he had been at the residence where he died and in state. Unfortunately, whoever filled out the certificate was a little vague on this one. When it comes to the question about how long he had been at his residence (Edhube), "some years" is given. When it comes to the question about how long he had been in the state, "many years" is given. Patrick's FindAGrave entry (including a picture of his tombstone), is here. 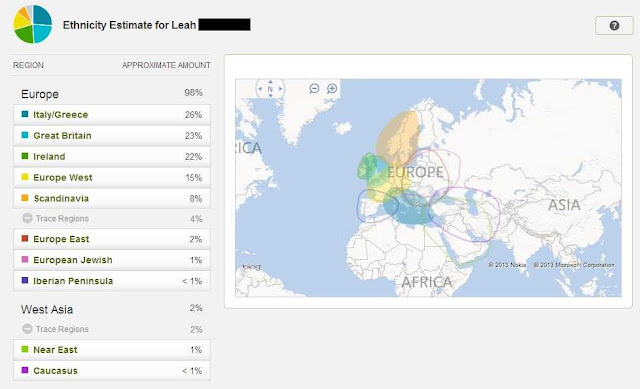 His father, Vincent Jackson Hudson, was my third great-grandmother's brother. 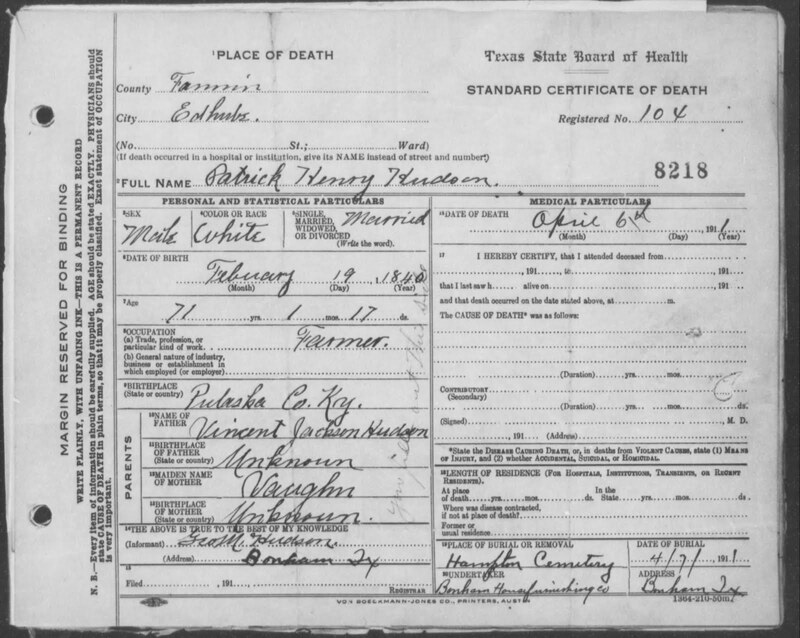 I was surprised the first time I saw a death certificate with the parents' names UNKNOWN. But now I realize that 100 years ago the surviving spouse or child might never have known their in-laws or grandparents like we do today. When someone immigrated from another country they typically left everything, including their family, in their home country never to be seen again. Very sad. You are right about how many awesome resources there are for Texas - I'm so glad that's where my parents' families are from! 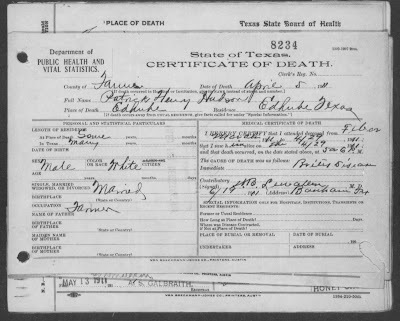 Those death certificates in particular are amazing. 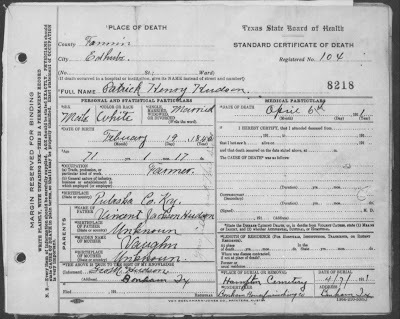 And I have probably mentioned to you before, there are still members of my father's family in Bonham/Fannin. Gotta get back there for a research trip some time.